MONTREAL - The Canadiens organization was deeply saddened to learn that former player and Hall-of-Famer Richard “Dickie” Moore passed away earlier today in Montreal. Moore was 84. Born in the Montreal borough of Park Extension on January 6, 1931, Dickie Moore was one of the most exciting and productive players of his era. After two consecutive Memorial Cup championships, in 1949 with the Montreal Jr. Royals and the following year with the Montreal Jr. Canadiens, recording 24 points in a mere 13 games, Moore made his NHL debut with the Canadiens mid-way though the 1951-52 season. In his Canadiens debut at age 21, he managed to record 33 points in as many games and was a deserving candidate for the Calder award as Rookie of the Year. Moore’s NHL career really took off in 1954-55 after he first etched his name on the coveted Stanley Cup in 1953. The skilled left winger would quickly become one of the league’s most prolific point getter. After successively recording 36, 50 and 58 points from 1954 to 1957, Dickie Moore rose to the top in 1957-58, notching 36 goals and a total of 86 points to earn the Art Ross trophy for the first time. Considering that he had played the last three months of the regular schedule with a cast on his left forearm, his achievement was nothing short of remarkable. The following year, Moore was even more dominant tallying 41 goals and a league-leading 96 points, shattering the season point record of 95 set by the legendary Gordie Howe and earning his second Art Ross trophy. Moore would end his glorious career with the Canadiens in 1962-63 with 594 points, including 254 goals in 654 games donning a Habs jersey. His goal and point production rank him third among left wingers in Canadiens history. Over his 14-NHL seasons, that a season with Toronto and another one with the St. Louis Blues, Dickie Moore amassed 608 points in 719 games. In the playoffs, he was equally productive notching 110 points in 135 match-ups. In 1974, Moore was inducted in the Hockey Hall of Fame and in 1998, The Hockey News ranked him among the top 50 greatest hockey players. 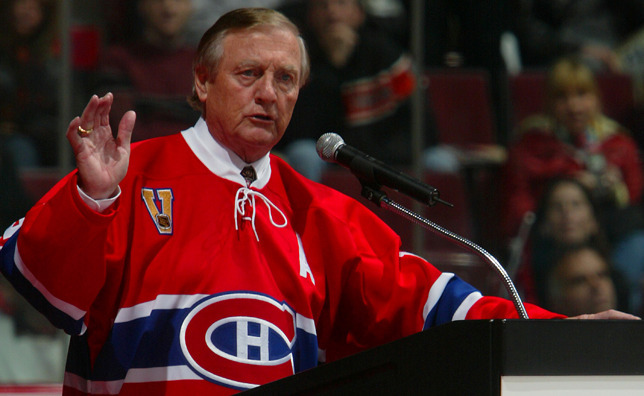 On November 12, 2005 the Montreal Canadiens paid him tribute by raising his famed number 12 to the Bell Centre rafters. Dickie Moore is survived by his daughter Lianne, his son John and their respective spouses and by several grandchildren.